Released on September 7th, 2015, by Curiosity Quills Press, Hour of Mischief by Aimee Hyndman is a fascinating action-filled, clockwork-fantasy adventure. I was drawn in by the lovely cover by Amy Chitulescu and I hung around because this is exactly the kind of book I have come to love Curiosity Quills for publishing. The aesthetic is sublime, but above and beyond that, this is a smart-assed, action-adventure story that reminds me in tone of the Indiana Jones movies--a fast enough, high-stakes plot to keep things rolling, but enough humour to keep me engaged, and make me want to come back to re-read. I'll be participating in an additional two stops on Curiosity Quills' September Releases Review Tour - come back on October 2nd and 3rd for those reviews! Hour of Mischief is available now! 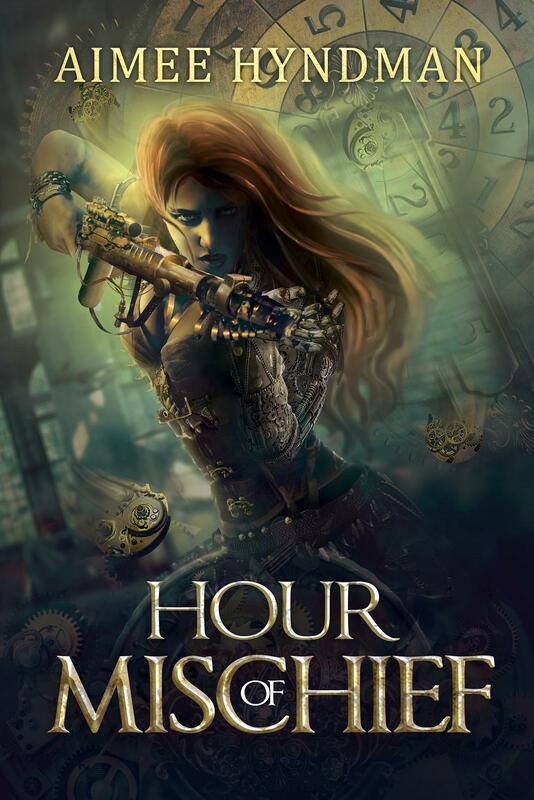 Hour of Mischief was a delightful romp through a clockwork-filled world. In a place where the gods actually walk among humans, making their worship and blessings all the more significant, Janet goes from a bad situation with her gang of thieves to an even worse situation, trying to help out the God of Mischief. While sometimes I found Janet to be a bit jarringly modern for the setting, I did quite enjoy her snarkiness, and the full commitment to impulsive behaviours. Leaping before looking may or may not be a trait I can commiserate with (see: reasons why this blog exists), and I do love it when a character actually embraces one of the 'negative' traits they're alleged to possess. Her drinking, fighting, and general lack of respect for authority made Janet surprisingly endearing. She's a seventeen-year-old who shoulders way too much, and Itazura, the God of Mischief, only makes it worse when he basically adds the fate of humanity to her pile of responsibilities. There's some impressive worldbuilding in Hour of Mischief--an important fact because there are many details to pick up. The book feeds them out slowly, building on our knowledge of this world with its tiered society and tiered gods. There are some lovely bits and bobs that I would love to return to in future books to explore in more detail. And, possibly because I've recently been bitten by the 'fantasizing about cosplaying' bug (but haven't actually done anything about it because my craft skills are at a solid -2), I spent quite a bit of time imaging how possible it would be to dress-up as certain characters. What really won me over is the blending of action-adventure and humour. There's a certain Indiana-Jones-esque quality to it all, punches (or knives) being thrown while snarky jokes are tossed out, a certain 'what have I gotten myself into/I must keep going!' sense to the story. I loved Janet's voice--Hour of Mischief is narrated in the first-person, from her perspective--but I also liked many of the other characters who pop up and bring their own specific blend of off-kilter to the story. I loved Hour of Mischief. I thought it had a great balance of humour and action, a likeable set of characters, and while the world seems superficially complex (but with some great set pieces and props--I love clockwork anything! ), the book laid everything out in easy-to-digest pieces that had me hooked. I want more--when's the sequel coming out? 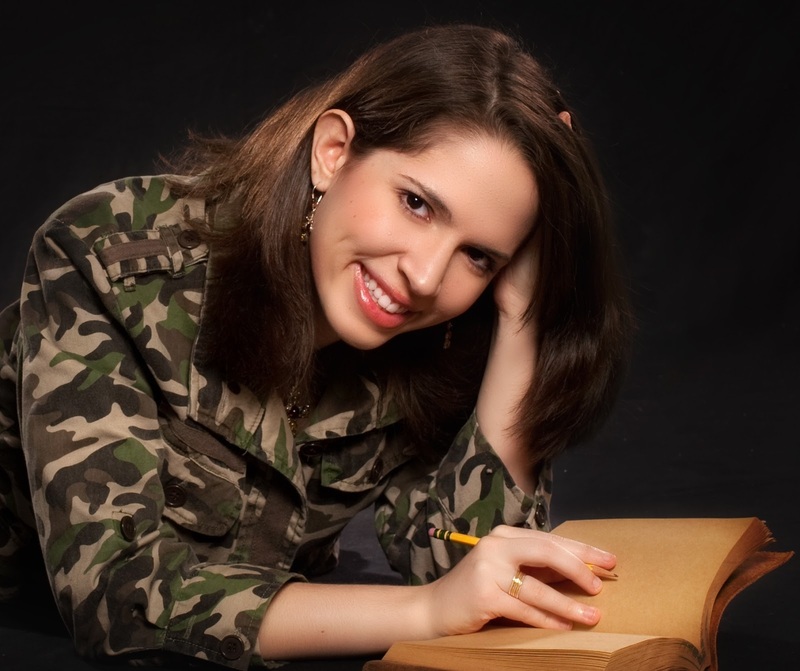 Aimee Hyndman has been writing ever since her toddler fingers could grasp a pencil. A lover of all things speculative fiction, she spent many a night penning the beginnings of novels that would never see the light of day. Now attending college in Iowa, double majoring in Creative writing and English, she has clearly never lost her love of the craft. When not writing and avoiding her school work, Aimee enjoys reading, singing, and acting at her school’s theater department. She is also a lover of anime and all things Disney. Her area of specialty is fantasy of all sorts but she dabbles in many genres— whatever she feels compelled to write at the moment. The plot bunnies are never ending but, luckily, so are the words!